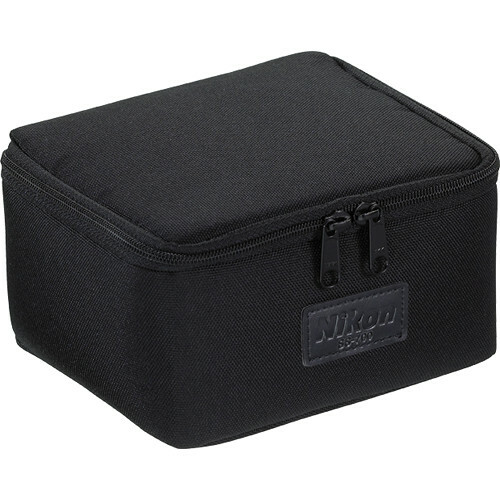 The Nikon SS-700 Soft Case (Black) is a replacement for the case included with a Nikon SB-700 Speedlight Shoe Mount Flash and its supplied accessories. Box Dimensions (LxWxH) 9.2 x 7.9 x 2.2"
SS-700 Soft Case for SB-700 Speedlight Shoe Mount Flash is rated 1.5 out of 5 by 2. Rated 2 out of 5 by arch enthusiast from Not well thought out They changed from the holster type case of the SB-600 to this square box type case for the SB-700. This would have been fine if they'd have placed the belt loop on the bottom and not on the side. This was an unquestionably terrible design decision and renders it useless for wearing on a belt. I now need to buy a different holster type case for my SB-700 so that I can wear it on my belt where I prefer it. It is also much more difficult to fit in a travel case with this square shape. Rated 1 out of 5 by Alex Fisher from Awful Yup, this case is poorly designed and does not worth the money! I had to buy another storage for my SB-700 and have chosen Lowepro case (LOLC1SF).